What kinds of Stock Quote service does DBS Bank provide? 1. To enjoy more updated market information, please open a Securities Account with DBS Treasures Account/DBS Account and log on to DBS iBanking (all customers)/DBS digibank(non Treasures customers)/iWealth® app (Treasures customer). If you do not have DBS Treasures Account/DBS Account, please visit any of our branches to open the account. If you have a Securities Account with us already but not yet a DBS iBanking customer, please click here or visit any of our branches to apply now. If you has not yet had a Securities Account, please submit an application for Securities Account opening through DBS iBanking or visit any of our branches to open the account. You can use your existing DBS iBanking username and password to login DBS digibank. 2. 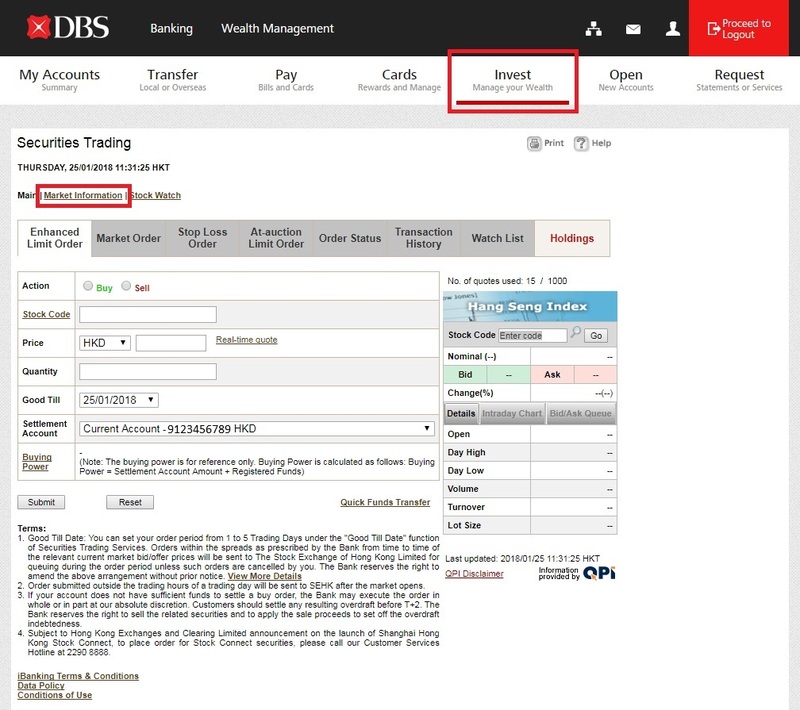 To use DBS iBanking for Stock Quote service, please login DBS iBanking and choose “Market Information” under “Invest”. 3. 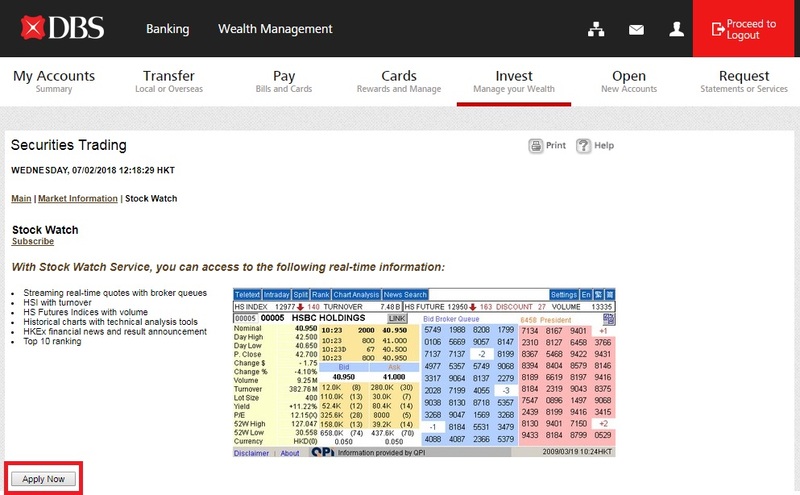 To use DBS digibank for Stock Quote service, please login DBS digibank/iWealth® app and choose “Securities”. Please go to DBS homeage and choose “Invest” or click here. 5. 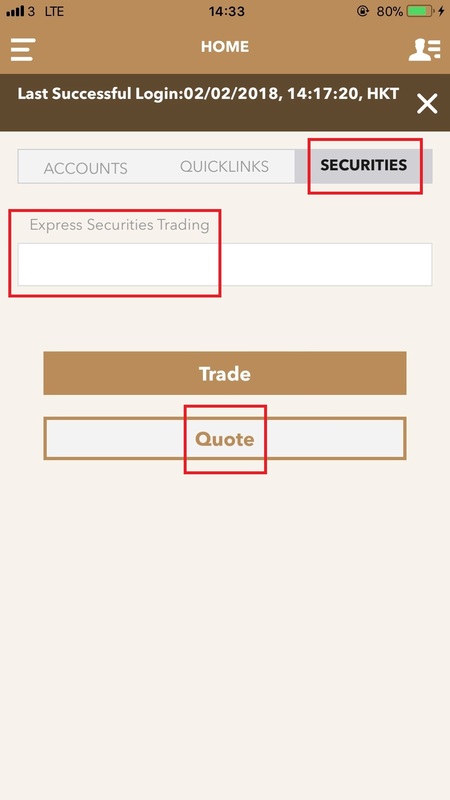 To enjoy advanced Stock Quote servce: Streaming real-time quotes, you have to apply for it separately. Please note that this is a charged service. Please refer to Rates and Fee Schedule for details or click here. To apply, please login DBS iBanking and choose “Stock Watch” under “Invest” and click “Apply Now”. How to open a DBS Treasures account?